It allows you to customize the font and choose any monospace font you have available (I chose DejaVu Sans Mono). Also can select font size, bold, etc. It allows you to customize the color palette. Not just the default foreground/background (command prompt allows this), I mean all the other colors. For instance, bright blue and bright magenta look terrible on a black background, so I chose softer shades of these colors (see the screenshot). It supports tabs! Not that I use tabs, but it supports them! It has a menu bar, toolbar, and status bar by default. I don't like these so I disable them (I disable the menu bar in gnome-terminal too). You can right-click anywhere to get a menu. You can change the transparency of the window, like with Linux terminal emulators. In this regard it behaves like a Linux terminal in a compositing window manager, in that the window is truly transparent and you can see stuff below it. I don't much care for this (I prefer the fake transparency like gnome-terminal uses without a compositing window manager, where it just copies your desktop wallpaper). Perhaps most importantly, the window can be resized to any size ya want. With the regular command prompt, the window can be no wider than 80 characters (you can adjust how many characters, but it's still limited to whatever you set and can't be made wider during run-time). You can download Console from SourceForge.net. I also recommend OpenSSH for Windows. It installs OpenSSH from the Cygwin project, without the entire Cygwin installation (which is enormous, and is overkill if all you want is SSH from it). 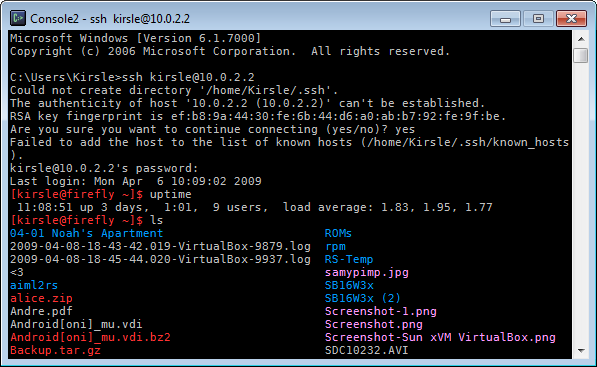 With this you can open a command prompt or Console window and use SSH as though you were on a Linux system.